I am a huge fan of watch winders. The practical ones that is, the ones that don’t take up too much space and do the job right. Now, I have written on winders before (a 2009 watch winder review and one in 2005) and always wrote that you should be on the look-out for a programmed or programmable winder. This means that the winder will work a few programs in such a way that your watch gets enough excercise to keep on running. Although I can’t imagine that you are still able to overwind your watch, a running watch is still better than a watch that stands still. This probably has something to do with the synthetic oil that thickens a bit after a long period of non-wear. 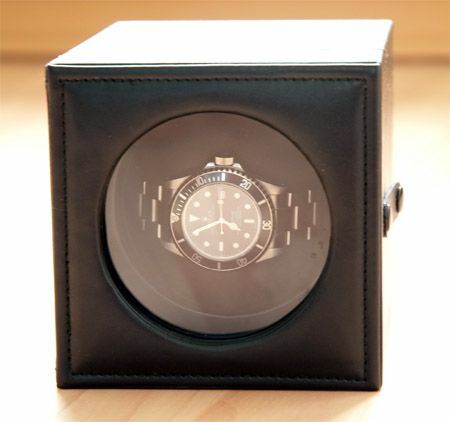 Anyway, the Leather One Watch Winder by this English based firm called Watch-Winder.co.uk has a programm that makes sure the watch turns clockwise for 5 minutes then rest for 15 minutes; turn counter-clockwise for 5 minutes then rest for 15 minutes. This cycle is then repeated. This low-cost and easy to operate winder comes with an adaptor (UK plug, but you’ll find a converter at any super market) and is ready to go as soon as you take it out of the box it came in. The black pillow is big enough for large watches, and can be squeezed enough for people with small wrists. On the backside of the winder you’ll find the connector for the adaptor (can’t go wrong) and a red button for operation. There is no more to it. The rectangular shape of the winder makes it easy to put it away any way you want, but I believe it will function best if the winder is placed flat on a table/shelf/floor, as pictured below. 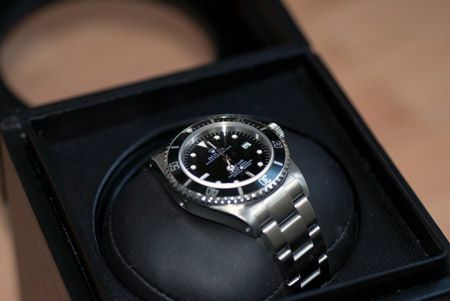 I tested the winder with my 1997 Rolex Sea-Dweller ref.16600 and it works perfectly. I did screw down the crown and gave it a few turns before putting it in the winder, but it kept running for a whole week. I have seen more expensive winders making my watches stop after the minimum power reserve had been reached. 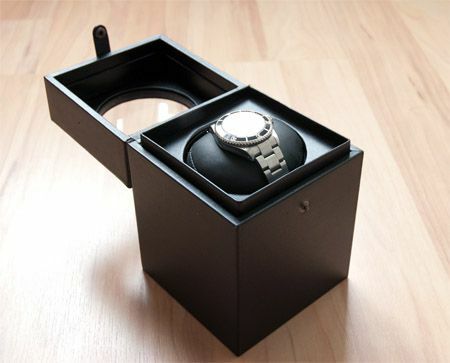 If you are interested in getting a watch winder for your watch (or watches), make sure you decided whether you want to have it stored/tucked away somewhere out of sight or in a safe (battery operated?) or that you need something small and convenient like the Leather One Watch Winder (which is adaptor-only) or that you want to have a nice looking watch winder with wood or piano finish to show-off your watch or collection of watches. My friends over at Watch-Winder.co.uk has them all, for very sharp prices. 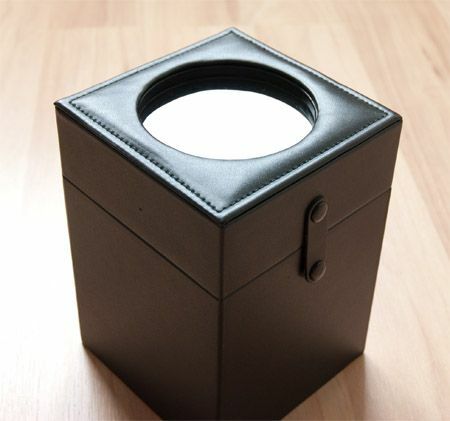 The Leather One Watch Winder measures: 110 x 110 x 160 mm (L x W x H). The removable, adjustable watch holder will to take a maximum watch strap width of 30mm and circumference of 210mm. It can be compressed to hold a strap circumference as small as 160mm. The watch winder leaves enough space between the pillow and the cover for a large wrist watch (think IWC Big Ingenieur of Panerai).